Cat behavior has fascinated people throughout history. Cats are independent, but still social animals, and combine a hunting instinct with playfulness. Cats are territorial animals. Dogs belong to their master, cats stick to their home. That’s why your cat doesn’t like traveling. Cats see their home as holy ground. They mark it by rubbing, scratching and spraying. Spraying is also marking behavior. 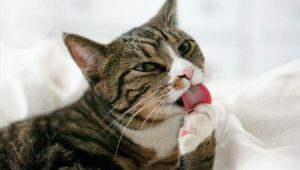 Read here why cats sprays and what you can do about it. Their memory for sounds, smells and sights is excellent. It is known that cats manage to return to familiar territory from great distances, negotiating obstacles as rivers and cities. Cats do not accept hierarchy from people. You are not their master, but their roommate or fellow cat. Cats can save themselves easily. Still they like company very much. Although they are less responsive to vocal commandments than dogs, cats do listen and can be taught to perform numerous tricks. They need to get a reward, though. PUNISHMENT OFTEN HAS A REVERSE EFFECT ON CATS. Instead of learning they can get scared and start seeing you as their enemy. Cats have inborn skills. This is first visible when they are kittens. Sucking milk is a reflex, not something they are taught. Mating is another example of inborn cat behavior. Other habits are learnt by copying from their mother. Kittens learn grooming very young. At six weeks they can groom themselves. SELF GROOMING IS A MATTER OF PERSONAL HYGIENE. BUT NOT JUST THAT. In hot weather they groom to lose body heat; sweat is ineffective due to their fur. Grooming is also used to remove loose hair and parasites. However, grooming may lead to hairballs. Cat behavior is very much ruled by their senses. These come together in cat play. Cats love to play, especially when they are young. Kittens can spend hours playing … and biting! Don’t worry. By playing they pick up the rules of hunting. Toys are preys in their eyes and during cat play they behave like a cats in nature would. Read more about cat toys here. Even elderly cats will find it difficult to resist running after a toy mouse, colorful ball or elastic. But although cats are fast runners, they don’t like running for long. Patience, silence and observation are their main weapons, followed by a sudden attack. Once playtime is over, cats lie to sleep. CATS SLEEP FOR ABOUT 16 TO 17 HOURS A DAY. Pregnant cats sleep even more. In the last stage of cat pregnancy, queens become restless and start to search a place to give birth. By nature cats sleep mostly at daytime. It’s the kind of cat behavior everybody knows. Very often cats sleep lightly, constantly scanning their environment with their senses and ready to react on the slightest movement or noise. Felines prefer to choose their bed themselves. It should be warm, high and protected. DON’T BE SURPRISED IF YOUR CAT CHANGES HIS FAVORITE SLEEPING PLACE EVERY TWO WEEKS. 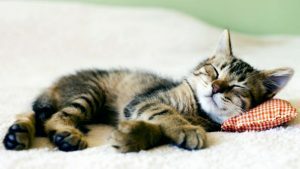 Although your cat will love to have a special bed, you can’t force to sleep on the same place for years. Change is part of their instinct. 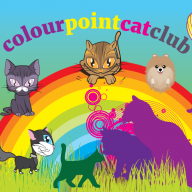 Cat behavior can be influenced through kitten training or by a successful alternative method like clicker training, but you won’t change a cat’s instinct. In the end it is instinct that determines cat behavior. Next Next post: You Have A Spraying Cat? Do Something About It!